What does it say about our country that so many products, while becoming ever more costly, are increasingly less and less well made? It especially galls me that two of my favorite items have taken this hit, as I remember them back in the day when they were truly premium products. I’ll always remember my mother’s conviction that a single quality product may cost more up front but in the end it was worth more than many cheap and poorly made alternatives. Hence my introduction to Coach handbags. 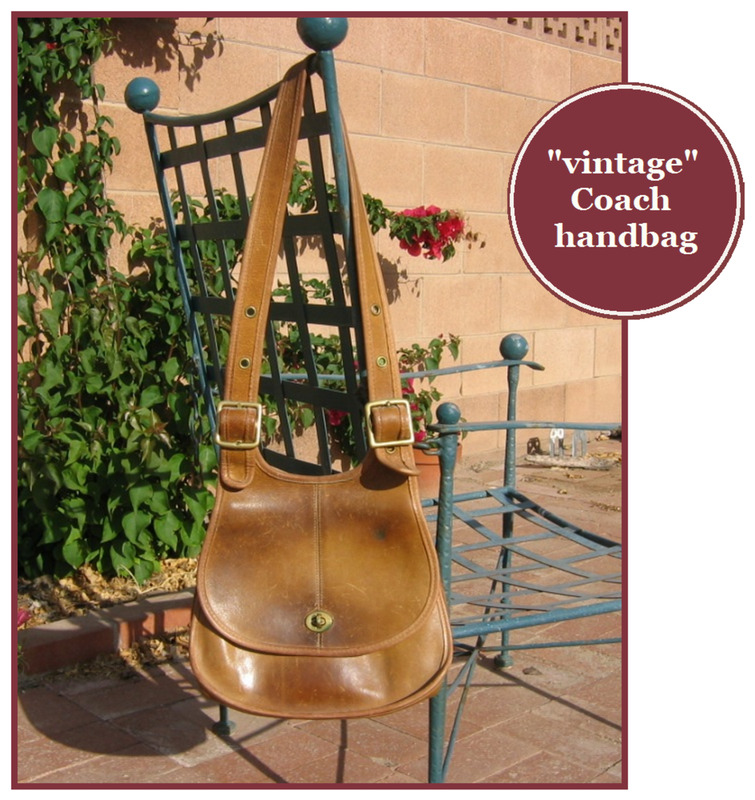 I bought my first Coach in the late 70s, early 80s – a Crescent Saddle Bag. 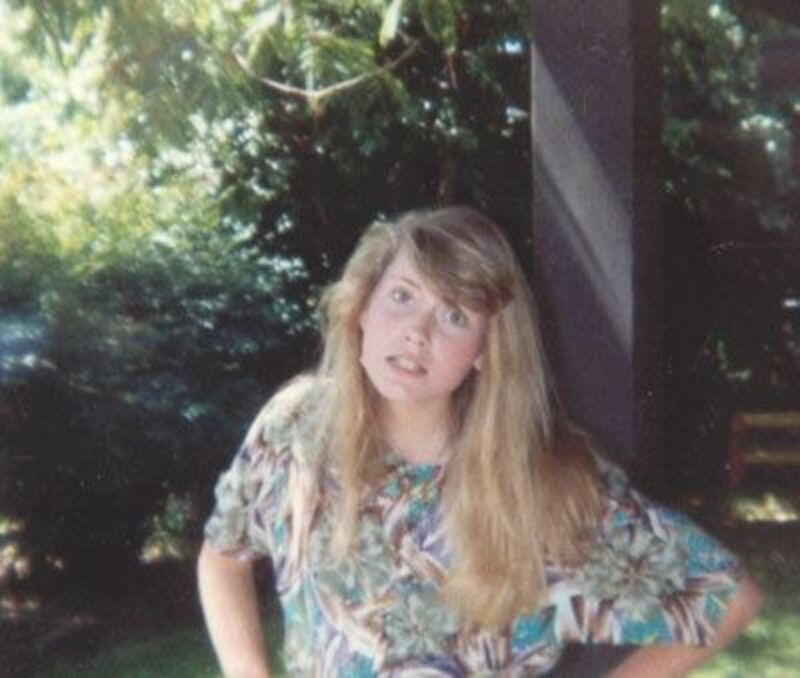 No boutique stores back then. They were being sold in a clothes store near the plaza in Santa Fe, New Mexico and cost between $60.00 and $70.00, expensive in those days! The purse was made of soft, thick, beautifully finished, golden colored leather and the hardware fittings were heavy brass. I loved its simplicity. Fast forward 30 years and today’s Coach handbags, compared with their originals, are literally unrecognizable. Coach's once simple and classic purses now have patterned canvas, textured and shiny leathers, unnecessary “gewgaws,” silver plated hardware and fabric linings and could pass for any other nameless brand. A horrible new logo of a stagecoach (à la Hermès?!) is now the symbol for what once represented quality. Their website is filled with row upon row of cheap looking, Gucci-like wannabes. Tragic. And they actually have the gall to expect customers to cough up $250.00 plus for these atrocities?! A recent headline bemoaned the fact that Coach's sales were down. The company's planned response? Raise their prices! For awhile, there were apparently enough people who remembered the original Coach styles that the company maintained a Coach Classics line – but even that has disappeared. What is thriving is the market for the true vintage purses still available. I found some well-maintained Crescent Saddle Bags going for $150.00 plus! Of course, my mother’s truism that “you get what you pay for” also applied to ice cream. Häagen-Dazs, back in the late 70s, 80s and 90s was a rich, creamy, thoroughly fattening ice cream which came so close to homemade that it was pointless to go through the exertion of making one's own. The coffee flavor, one of the company's three original flavors, was always our family favorite. After moving out on my own, free to indulge without a mother’s oversight, I became a Häagen-Dazs addict. I would go through a pint at a time, several pints in a week. I loved their ice cream! Then, years ago now, I suddenly noticed it didn’t taste the same. Unconcerned, I thought that perhaps I had been unlucky and bought a bad batch, so tried a different flavor. But that didn’t taste right either! Instead of being rich and creamy, it tasted "fluffy" and "thin." The Macadamia Brittle no longer had chunks of macadamias - it had chips. The German Chocolate Cake didn’t have the once familiar big, gooey ribbon of coconut frosting swirled through its center – you were lucky if you found a thread. About the same time, Häagen-Dazs changed their label, replacing their once classy and immediately recognizable packaging with a mere shadow of the former. 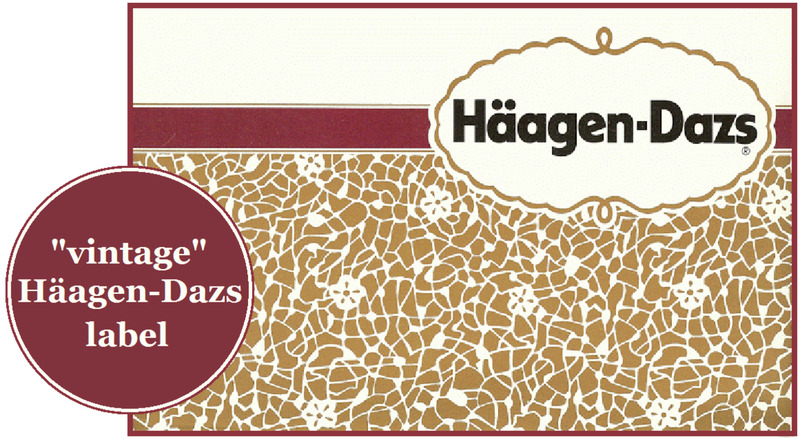 The internet revealed to my horror that Häagen-Dazs had, in fact, been taken over by the Nestlé subsidiary Dreyer's! Not quite believing my misfortune, I headed directly for the nearest grocery store and, sure enough, Häagen-Dazs was no longer Häagen-Dazs! It was true! The real deal had been replaced by an ursurper of ill repute - in my books anyway!. Livid, I fired off an email to Dreyer's complaining bitterly of the cheapening of one of my favorite products. I received a form letter back stating that they had not changed their product (apparently unaware that it was completely useless to lie to an original Häagen-Dazs connoisseur) and “valued me as customer,” blah . . . blah . . . blah. Dreyer’s most recent round of cheapening has come in the form of making their containers just s l i g h t l y smaller than a pint. Oh, it still looks like a pint but it’s actually two ounces smaller! When will it stop?! Pathetic! Why, oh why, does this happen? 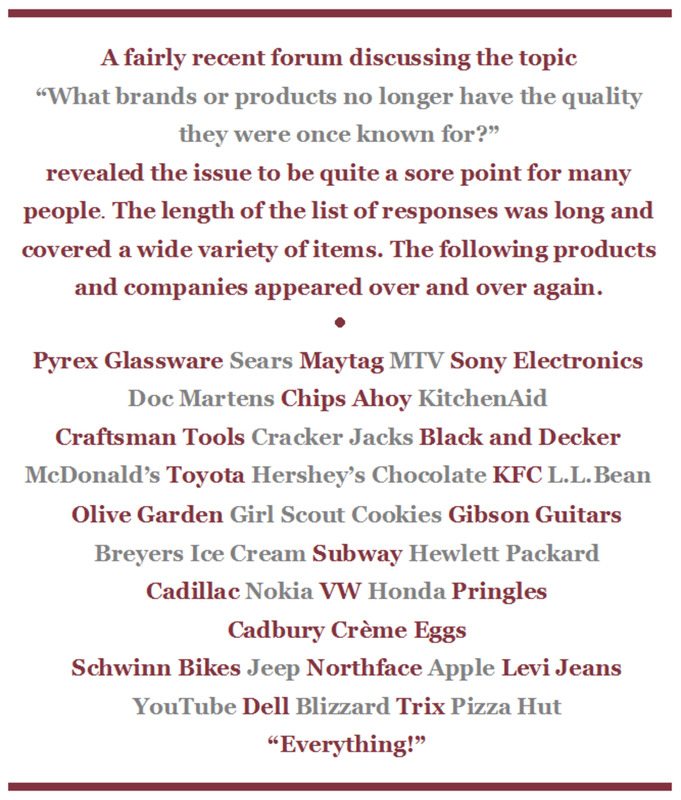 It seems that today companies have lost taking pride in the quality of their products and it's all about profit. It feels rather like a “catch me if you can” plot on their part – they make their items slightly shoddier and infinitesimally smaller and hope you don’t notice. Oh, their advertising extols how well made their goods are but, unfortunately for them, there are still some of us around who remember what real quality is … or 'was.' In the companies’ favor is that the typical consumer of today has a very short memory and is obsessed with a label versus how the product is actually made. It doesn’t help that the newer generations don’t even know what they’ve missed. Their grandparents are fast becoming part of a generation that has forgotten that washing machines used to last for decades, that clothes were once made of quality cloth (even “cheap” ones) and that Campbell’s Soup actually used to taste like homemade soup, not the oversalted, tasteless concoctions the company claims to be wholesome today. It is up to us, the consumer, to put the brakes on this race to the bottom. We buy these products. We are the ones accepting and still consuming the trash that corporations use to fill their shelves. We keep demanding cheap prices without thinking about the corners a company will cut to reach that price. 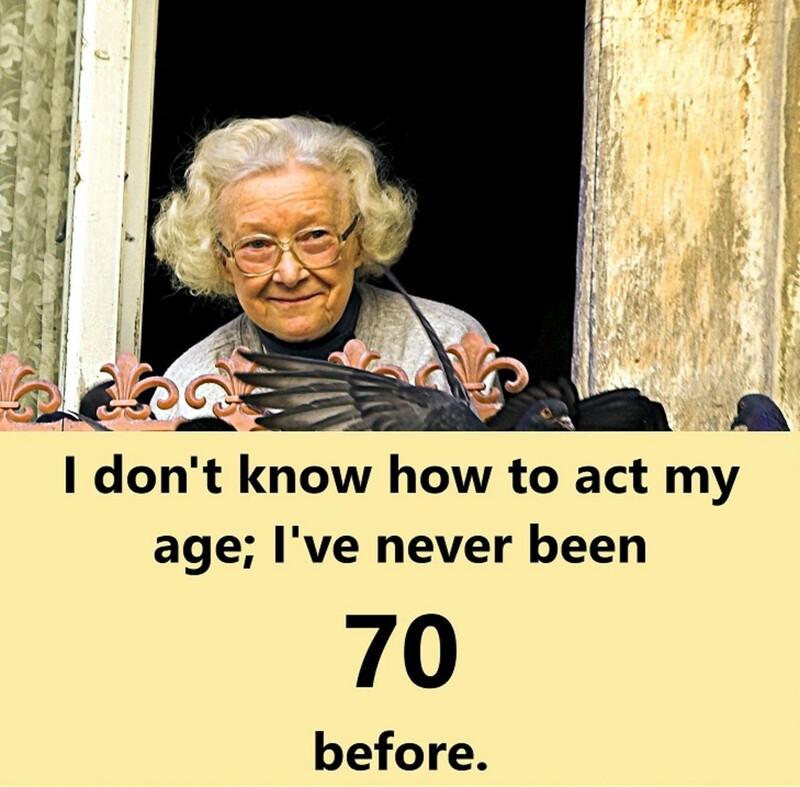 Our nation has been brainwashed into believing that we are better people for having the newest, hottest widgets and that we, unlike older generations, should disregard the fact that they are poorly made. It is assumed they won't last; they are built not to last so that we'll throw them away and run out and buy another. We need to turn this race to the bottom around and begin a slow and steady climb back to real quality. It doesn't appear that will be an easy task. Have you ever had one of your favorite products changed and ruined? Haagen Dazs quality is horrible. It became cheap tasting, overpriced ice cream. Couple days ago I paid over $7 for one scoop og ice cream in their store and it tasted awful. Thinking that it was a fluke I went to the store and bought couple of pints of their ice cream. Sadly, they tasted equally bad. I am not buying any more. When the season comes around,i pick up like 25 pints of peppermint bark. Stuff is bomb!!! Its got a very unique white chocolate base. I still have a lovely black bucket Coach bag from the 90”s. Soft leather and classic . The new Coach bags look like knock-offs and nothing like the original product. So cheesy. Being a die hard fan of Haagen Dazs' Butter Pecan, last night I too noticed the change. The once creamy and dense ice cream is now replaced by a lighter, watered down version and the pecan halves that used to be in abundance have been chopped into small bits of matter. Bad enough that the cartons are smaller (did they really think we wouldn't notice), I could have accepted that as long as the quality was the same, but it isn't. I don't know whether to be steaming mad or heartbroken. I arranged my diet around having an occasional pint every now and then and now I am seeing it slowly morphing into...dare I say it...Edys. Is there no justice in this world? Shame on Haagen Dazs for selling out. Perhaps the original owners could do what Saban did for the Power Rangers with Disney...buy it back. Am actually far more upset over the ice cream than I am about the handbags. Will never forgive Haagen Dazs for "selling out!" And yes, waaaaaaaay too expensive now! And they've sneakily made their cartons smaller hoping no one will notice - I won't even buy it for a treat anymore!